Post by Dr Hannah MacPherson, senior lecturer on the Geography BA(Hons) course, who is working on a new book with the College of Arts and Humanities at Brighton. As geographers we collaborate with people who specialise in all sorts of different things which makes studying and working in this field amazingly diverse. I’m working with Alice Fox, course leader in Inclusive Arts in the College of Arts and Humanities on a book called Inclusive Arts Practice and Research. 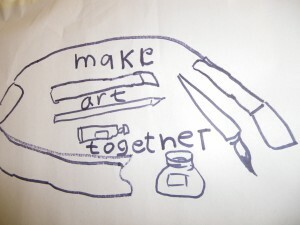 The book is about creative collaborations between learning disabled and non-disabled artists, how these collaborations can be used for social changes and as a way of conducting research with this diverse group. So how does this involve geography? I teach a module called geographies of disabilities and impairment, one of the things we look at is how people with disabilities can contribute rather than how we can help them. And one of the things we look at in the book is how clay as a material can in effectively listen to the people working with it. We’re very excited to be presenting our cutting edge thinking at London’s Southbank Centre in 2015. I’ll keep you posted about where we’re up to in the run up to the launch. You can also find out more about the artists working on the project on their own blog: Side by Side.